Annie (Japanese: アネモ Anemo) is a character in Splatoon and Splatoon 2. 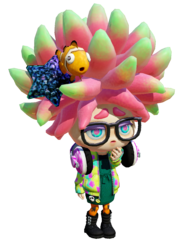 She is a sea anemone who owns the headgear shop, Cooler Heads, along with Moe in Inkopolis. She later opened the SplatNet 2 Gear Shop in Splatoon 2. Annie has pink hair tinted with pastel green at the tips of her tentacles and also houses Moe in it. Her skin is a pale beige colour similar to shopkeepers like Sheldon and Flow. She has cyan eyes with hot pink pupils and baby blue scelera, along with purple eyelids with eyelashes. Annie possesses a shiny indigo star shaped accessory in her hair, and also has black glasses. She has magenta headphones and a charteuse jacket emblazoned with magenta and aqua blue squids. Annie also has a dark teal dress, orange tights with black squids on it, and black biker boots. Annie's version of DJ Lee Fish's song Lookin' Fresh has louder treble, i.e. vocals, and minimal percussion, giving it a weaker sound in that respect. This is a reflection of her shy, detached personality, as well as the fact that she sells gear for the top part of the buyer's body, hence the emphasis on the treble. It is hinted at in the nineteenth Sunken Scroll that Moe is the one manipulating Annie, reading, "Is the big fluffy one providing shelter for the little fishy one, or is the little fishy one manipulating the big fluffy one? We may never know..."
"O-oh... Hello. I-I'm very sorry, but um... I'm afraid we have... a sort of rule here, you see. We don't sell to people who aren't, um, fresh enough. Once you reach, say... Level 4... I should be able to help you. Maybe you could visit the lobby and play some, um... regular battles? That might help you level up..." - When a player below Level 4 enters the shop.
" Oh... hello. So... Welcome to Cooler Heads. Feel free to, um, look around if you want. All the gear here has, you know, abilities and stuff... If you want to know more, you could press and look at the manual. If you're into that sort of thing... " - When a player at Level 4 or higher enters the shop for the first time. "You're looking pretty fresh these days. I'll see if I have any gear to suit you... - When entering the shop after reaching Level 5. "You're like...the freshest Inkling I've ever, um, seen with my eyes... I hope my gear is good enough for you... - When entering the shop after reaching Level 15. "Oh... OH! Um, w-welcome to Cooler Heads and stuff... WOW! I, um... sorry. You... Y-you're just too fresh for words. Everyone's talking about you and, um, sorry..." - When a player at Level 20 or higher enters the shop for the first time.
" Oh, um...hello. You're kinda, sorta offline right now. I can't help you until you connect to the internet... " - When the player is offline. "Oh, um...hello."' - When the player enters the shop. "Y-you'll buy it...?" - When the player selects a piece of headgear. "Y-you'll equip it...?" - When the player purchases a piece of headgear. "Thanks, um, a lot! Y-you know you can tap Equip on to swap out your gear, right?" - After the player chooses whether to equip a new piece of headgear. "O-oh, I think you might already have that one..." - When the player tries to purchase headgear they already own. "Oh! Um, I'm so sorry, but... it looks like maybe you forgot your money at home... - When the player does not have enough Cash. "Ahh... Hello."' - When the player enters the shop. "Th...Thank you very much! Y...You know you can touch, um, equip on to equip your gear, right?" - After the player chooses whether to equip a new piece of headgear. "O...Oh, I think you might already have that one..." - When the player tries to purchase headgear they already own. "Ahhhh... I'm awfully sorry, but... It looks like you don't have quite enough money" - When the player does not have enough Cash. (...Ah, w-welcome... ...Oh my! Sorry... This shop... Um... Sorry... We have a rule not to sell anything to unfresh kids... It seems you get level 4 and... You'll be little fresh... You'll get your level up as you play the Turf War several times... I think. ) - When a player below Level 4 enters the shop. (...Ah, w-welcome to Cooler Heads... If you want... please take a look around... All of the gear comes with abilities that will help you in b-battle... Please press and tap 「？」 if you want to learn more...) - When a player at Level 4 or higher enters the store for the first time. (Are you going to buy it...?) - When the player selects a piece of clothing. (Are you going to e-equip it...?) - When the player purchases a piece of clothing. (T-thank you very much~ T-to change your gear, touch "customize" on , p-please.) - After the player chooses whether to equip a new piece of clothing. (...Eh, ah, s-sorry, you don't seem to have enough money...) - When the player does not have enough Cash. Annie's name is a pun of the word "anemone," as it sounds like the "ane" in anemone. Moe completes the anemone of the name. It is possible that Annie has an interest in Sheldon. However, the possibility is only floated in Chapter 4 of the Squid Sisters Stories when Callie blurts out in excitement, "Do you think Annie and Sheldon...?!" to which Marie responds, smiling, "No way, not a chance." In the same chapter, according to Crusty Sean, Annie was also looking for a new gig and had kept herself busy decorating weapons at Ammo Knights. The more she did it, the more she felt a detail-oriented part-time job suited her perfectly. This is probably what inspired her to start the online retail service, SplatNet Gear Shop. It's revealed by Callie and Marie in Splatoon 2 that Annie got too flustered greeting customers at her shop that she decided to go online to SplatNet 2. Annie in her headgear shop, Cooler Heads. Annie's reaction to the player not having enough Cash. Annie being thrown off-balance when the player switches to Cooler Heads. Official art of Annie, Moe, and Sheldon as a promo for Version 2.2.0. German Anne-Mona Combination of the names Anne and Mona, resembling Anemone.